The ever popular name Overstock just lets you to have flashes of designer brands, home goods, furniture, women’s fashion electronics and many more product categories. When you set out in the online selling domain, did you always have an eye on Overstock marketplace? With ChannelSale by your side, you can easily get going, open an Overstock seller account and engage in making a name for yourself by being the best among Overstock sellers. We have ecommerce solutions in our hand, facilitating the multi-channel marketing campaign that can maximize the reach of your business and broaden the horizons of your sales graph. We engage in Overstock integration, Overstock feed management and optimization with our high-end software letting your vast array of products to earn maximum level of visibility across multiple distribution channels. Whether to go With ChannelSale Overstock sellers software or not? We engage in Overstock automated product listing, real-time inventory management so that you are always updated about your product performance. Reaching the profit yielding search engines for your products is easy and convenient with us. With our software solutions, Overstock product data feed optimization and management becomes a hassle-free process. Get step-by-step assistance from our marketing pros in Overstock store management with ChannelSale acting as the able Overstock store manager. Our platform keeps any confusion or faults at bay when engaging in the data transfer process. We deftly offer product catalog management services. As an Overstock seller just let your business grow at an astronomical pace as we with our team of professionals, make your Overstock selling absolutely seamless for you. Get Overstock order fulfillment and Overstock order shipping tracking updates at your fingertips. 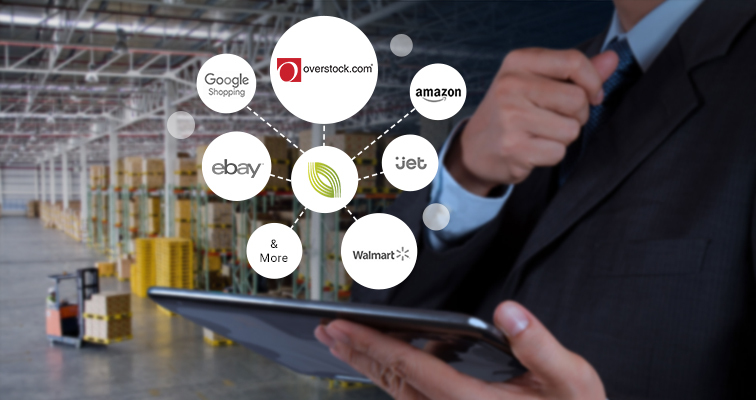 ChannelSale’s Overstock plugin directly links up with our pre-configured integrations on webstores examples Magento, BigCommerce, Volusion, Shopify, 3D Cart, NetSuite, Yahoo store, AmeriCommerce & more; shipping / order management solutions examples ShipWorks, ShipStation, OrderMotion, OrderLogix, StoneEdge & more; Accounting software QuickBooks; Repricers etc. Your streamlined product listing process on Overstock is done by ChannelSale in product feed file in formats CSV, TXT, XLS or API-XML and further synchronize them across all the other top online marketplaces, comparison shopping engines and affiliate networks. Whether it is multi-variation products / parent–child relationships, we list all. Products can have multiple sizes, colors, material types etc. We have granular level product category mappings so that product listing is aptly done in tune with Overstock product category. Have variable pricing for Overstock and other marketplaces / shopping engines, or retrieve your Amazon / eBay pricing to be sent to other shopping engines or markup pricing over cost price. Custom product data attributes are supported. In order to optimize the product listings on the shopping sites, the best practice is to include data for as many product attributes as available. The process can be facilitated by bullet point descriptions, search terms, video link, multiple warehouse inventory, gender, pattern etc. We keep you on your toes with real time inventory updates – avoids over-selling and under-selling issues. For example - If a product sells on Amazon, eBay, Sears, Newegg, Rakuten, Wish etc., the updated remaining quantity in hand would reflect in your ChannelSale account and further on Overstock. Centrally manage all Overstock orders and shipping tracking updates. Automate exporting Overstock orders to third party order fulfillment platforms / dropshipper’s, Fulfilled by Amazon, or to suppliers on an hourly basis. Setup to automatically retrieve order shipping tracking number on Overstock.